JOE PASQUALE is a household name as a comedian: he enhanced his reputation by winning TV’s I’m A Celebrity! Get me Out Of Here in 2004, and now he’s the star of Monty Python’s hit show Spamalot. The Essex-born comic says he grasped life by both hands after coming out of the I’m A Celebrity jungle because the experience changed him so much. “In the past I wasted a lot of time, but when you’re forced to waste time it makes you think,” says Joe. “I only found that coming out of the jungle and I thought ‘If you can jump out on a plane you should be able to’. “So, I learned to fly, got my pilot’s licence after eight months. There were all these exams to pass and I realised I could pass them, even though I never passed any exams at school. “Then I thought I’d do a degree. I live in Grays in Essex and ever since I was a kid I liked finding fossils in the mud and it stuck with me. “I’ve got 210 points and you need 300 for the Open University degree. I love it! You spend so much time in this business hanging about. You might be on stage for two hours a day, the rest of the time you’re just sitting there. “How many times can you go round the shops or waste time playing video games?” Joe’s activities also spread to running, boxing and, er, climbing volcanoes. “I started running and did the London Marathon when I was 50. It took five hours and 50 minutes, but I did it,” he explains. “I’ve been to Peru and climbed volcanoes – and I also took up boxing. The burst of mid-life activity was all spurred by his weeks in the jungle for I’m A Celebrity and he explains: “As a TV viewer you only see an hour a day which Ant and Dec make look like fun, but the reality is there’s another 23 hours where nothing happens. “Your world gets smaller and smaller and the smallest thing becomes important to you. Someone sniffing can seem very loud, especially if it’s every five minutes. “Also, you’re hungry and tired and thirsty and then they give you a bit of booze and your tongue loosens. They want you hungry and tired and ready to argue. If everybody is comfortable, they won’t get wound up. Joe is also currently enjoying a new lease of life in the theatre, in the role of King Arthur in Spamalot – and, as a childhood Monty Python fan, he’s loving it. The comedy musical, created by Python legend Eric Idle, tells the legendary tale of King Arthur and the Knights of the Round Table and features a bevy (or possibly a brace) of beautiful show girls, cows, killer rabbits and French people. The witch burning may have been cancelled due to health and safety but it features loads of songs including He is Not Dead Yet, Knights of the Round Table, Find Your Grail and of course the classic Always Look On The Bright Side Of Life. “It’s genius writing,” says Joe. “If you do what it says in the script, it works every time. The songs are great too. “My dad never used to like Monty Python so I was never allowed to watch it unless he was on nights, so I used to see it every other week. “But I remember being 13, going to see Monty Python and the Holy Grail. I sat there with my mate Kev and cried and cried with laughter, it just appealed to my sense of humour. 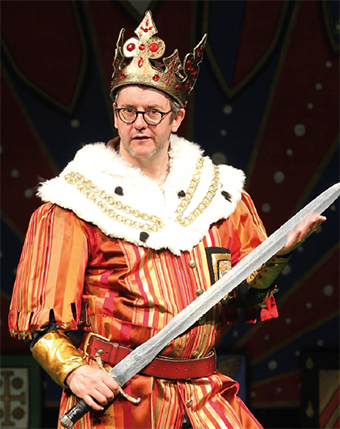 MONTY PYTHON’S SPAMALOT is at the New Victoria Theatre, Woking, from Monday (March 9) until Saturday, March 14.